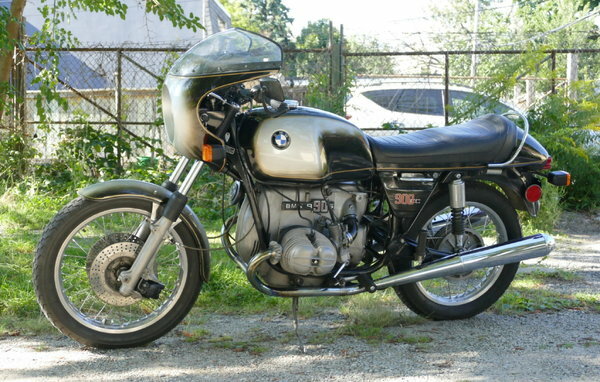 This 1976 BMW R90S is powered by an air-cooled 900cc opposed-twin paired with a 5-speed transmission. Purchased by the seller three years ago, the bike has been upgraded with an electronic ignition and an Easy Pull clutch cable. The battery, tires, and brake pads were recently replaced, and additional work included adjustment of the valves and timing, as well as a carburetor rebuild. The R90S featured a color-matched bikini fairing and dual seat with a tail fairing. The chassis offered dual hydraulic front disc brakes and rear shocks with adjustable preload.